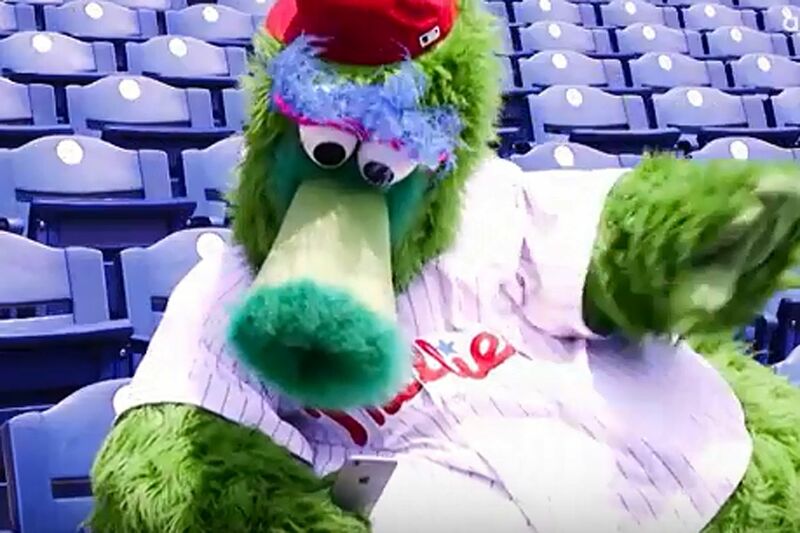 Phillie Phanatic orders a drink from a seat at Citizens Bank Park in a demonstration video from Aramark. "Text me some beer and some Cracker Jack…"
That's the general idea of an experiment that the Phillies and Aramark are conducting at Citizens Bank Park. Screenshot of a new pilot system to allow fans in some sections to order beverages to their seats. Specifically, the concessionaire is testing the use of Apple Business Chat to allow iPhone-equipped fans in certain sections of the ballpark to order water and beer from their seats. The arrangement does not require a special app, as previous seat-delivery concepts have done. Starting July 20, the pilot program will be available to fans sitting in Sections 142, 143, 144, and 145, making this literally an idea coming out of left field. The program will be conducted over 10 games (July 20-25 and Aug. 2-5). To order, a fan would first open the iPhone camera app and scan the QR code on the seat back. That will launch prompts on the iMessage text screen to place the order, which is then completed with Apple Pay. The drink will be delivered supposedly shortly after. Aramark says it's the first sports concessionaire to try this. Presumably, the setup will be expanded to the rest of the stadium with more items.